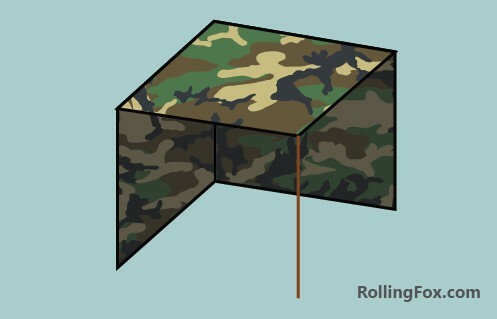 Below I’ve listed 25 different tarp shelter designs to help you get started. Each configuration has its pros and cons and there isn’t really a perfect design for all occasions. You’ll have to chose the right one depending on your situation or you could just try them all out to test your bushcraft tarp setup skills. The size of your tarp and the number of attachment points or loops will effect what configurations you can make. Generally the more loops or attachment points you have on your tarp the better. The tarp I use is 360 x 280 cm and has 16 loops, however you can use larger or small tarps as well. For our diamond shaped tarp specific setups see this guide. ​Most tarp shelters will have guy ropes included however if you don’t have any you can get them fairly cheaply. Most configurations need 3 or less guy ropes. You’ll also need some stakes; as with the guy ropes most tarps will come with a set of these. These can be bought cheaply online or at a local shop. Generally you’ll want to have at least 4. If you don’t have any you can substitute metal stakes with sticks. ​If you want to set up a shelter that requires trees in an area without them you can use poles or branches instead. Many people recommend trekking poles as the fit nicely to the tarps and work well in the snow. You also get these for around $15-20 online or at your local outdoors retailer. Most tarp shelter configurations will require 2 or more poles or trees to tie your guy ropes around. ​The location you chose and where you set up your shelter are important. You should study the weather in the area and choose a configuration that would best suit it. Ideally you should build on ground that slopes so if there is rain this is the direction the water will flow. If there are no slopes you should dig trenches to allow the water to flow off through them and away from you. Choose the right design depending on the activity. For example if you want an area for multiple people to eat or sit around the Dining fly is a good option. If you want to make a shelter for a hammock the diamond tarp setup would be best. The A-frame is a common tarp shelter configuration due its fairly simple design. You’ll need to find an area with 2 trees around 10ft apart depending on the size of your tarp. Tie 1 guy line around each tree roughly 4-5ft from the ground (depending on the size of the tarp). Make sure the line is tight to prevent any sagging. Throw the tarp over the line so the middle of the tarp meets the cord. Hammer in the stakes on each corner making sure it is tightly secured. If you have more stakes and available straps you can re-enforce the shelter. Good protection from rain or snow. The basic lean-to shelter is fast and easy to make. This is a good first one to try if you are inexperienced. As with the A-frame you’ll need two trees to tie the guy rope around and make sure there isn’t any slack in the line. Fold the tarp over the line. Pull the tarp taught at around a 30 degree angle and hammer in the stakes on each end. The stakes need to be on the outside of the shelter. The Bivy Bag cornet design offers very good protection overall and isn’t that difficult to erect. You’ll also only need to find a single tree or point to tie the line over. Start by tying the rope around the tree at 4-5ft and hammer in a stake to the ground at the other end. Make sure the low end is facing into the wind for maximum protection. Throw the tarp over the rope diagonally. Stretch out the corners and hammer stakes on each side. The floor should meet up with one side and the stakes will go through both the side and floor of the shelter. The odd name Adirondack is named after the Adirondack mountains. This design is basically a modified Lean-to that offers more protection from the sides, front and a small floor. Pull out the 2 front corners and peg them inline with the back. Attach the remaining two corners to the guy rope. This will leave a triangle shape on top. Use another guy rope to attach the remaining triangle to the ground in front creating a small cover. If you don’t have loop cords for the bottom fold you will need to use a an extra rope to pull the fold out. You’ll need to make a ridge line between two trees and now fold the remaining tarp over the ridge line. Secure the handing roof-line by tying down each edge to the ground. The Envelope is another simple configuration that’s fairly easy to do. Start by finding two trees and a good place to setup. Tie the guy line between the two trees. You can also use 2 sticks or trekking poles instead of the rope. Lay the tarp flat on the ground between the trees and peg the outside 2 corners. ​On the other side use tie outs to secure the top to the guy line or poles. The flat roof lean-to shelter is more challenging to make but offers more cover than the basic. The sloped side helps direct rain away from you. ​You’ll need to either use 2 poles or tie a guy rope around 2 trees for the roof-line. Throw the tarp over the roof-line and stake 2 corners into the ground. Roof can sag from heavy rain. Depending on your location you may want a clean area to sit on. Can also be used inside a tarp tent such as an A-frame that has no ground cover. No protection from rain, water, wind or sun. The half box shelter offers 2 sides of protection against the wind and a cover to protect against the rain. It’s not the easiest configuration to erect and requires 4 poles or sticks of even length. Start by folding the tarp in half. Peg in one corner first and one peg in the center to the ground. Now make a 90 degree angle and peg the other corner to the ground. ​Wedge the poles or sticks into the ground on each corner. 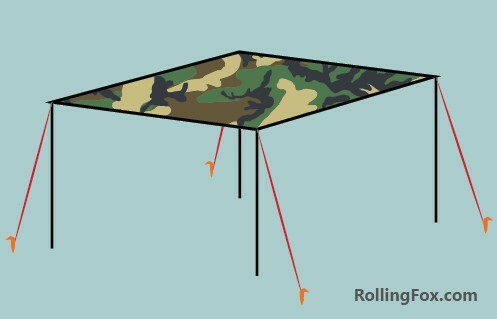 Fold the tarp over to make the roof​. The Diamond tarp setup is a popular one for hammock shelters. The configuration provides very good protection from rain and wind. No floor is needed due to the suspended hammock. Tie the hammock and guy rope around the trees. Make sure there is enough distance between the tarp and hammock. Secure each corner to the ground using 2 guy lines and stakes. If you have tie out loops available you can secure the top corners of the tarp to the guy lines to stop them moving. The Plough-point or diamond fly as its sometimes referred to is a fairly simple design that’s easy to setup. Lay the tarp on the floor in a diamond shape and so the tip of the diamond is pointing the tree. Hammer a stake and end of a guy line into the diamond tip that’s furthest from the tree​. ​Tie a guy line roughly 5ft around a tree at around a 45 degree angle. Stake the other 2 corners into the ground. The rectangular stall is similar to the flat roof lean-to design the only real difference is the flat side. You can either use poles or guy lines tied to two trees for support. Lay the tarp flat on the ground and mark the corners so you know where to place the poles. Force the poles into the ground where marked. Place the tarp over the poles and secure. Stake the vertical side into the ground and use 2 ropes to secure the open side ​corners. The ridge line lean-to provides very good cover from the rain, sun and decent shelter from wind. However it doesn’t have a ground sheet so it’s not ideal for heavy weather. It’s a fairly simple design but does require either poles or 2 trees for the roofline. ​This ones named the tortilla due to its shape and it’s a fast and easy shelter to set up. You’ll need a pole or tree to tie the guy rope around at a height of 4-5ft. Lay the tarp down in a diamond shape with one tip facing the tree. Fold in half using the top half tip closest to the tree to tie the guy line. Peg the far edge corners into the ground where the fold has been made. The basic fly line roof or Sunshade tarp as its sometimes know is perfect for creating shade and protection against the sun. It can also be used for protection against the rain however in heavy rain the water can collect in the center making the roof sag. The tarp will lay flat above your head using the guy ropes for support. You can either use 4 trees with 2 guy lines or 4 poles for support. Great shelter for the sun. Can sag easily in the rain. The basic fly roof is the same design as the sunshade shelter but uses poles with guy ropes instead. ​The downside is you’ll have to bring the extra poles along with you or have access to long sticks or branches. Great shelter from the sun. Heavy rain can collect in the center making it sag. The body bag tarp shelter or tube tent provides decent cover all round. It’s similar in shape to the A-frame however the body bag also has ground cover. You give up space for the ground cover but this will be big enough for 1 large adult person. You’ll need to hang the guy line between 2 trees slightly lower than normal. You can adjust the line height if you find it is to high. ​Fold the tarp over the guy line and make sure opposite ends both meet on one side. Secure each opposite end into the ground using stakes. Good rain run off on both sides. The dining fly is a popular design with good reason. It provides a lot of space, offers good shade and shelter from the rain. Some downsides include the lack of wind protection and ground cover. Depending on the size of the poles used will determine how much head room you will have. The forrester is a relatively complex design but offers very good all around protection from the elements. You also don’t need much gear and only a single tree or pole for the guy rope. It’s almost the same design as the bivi bag cornet but with the added protection flaps at the opening. A pole can be used to prop up the entrance instead of a guy rope. Great protection from rain, sun and wind. The half cone fly shelter offers very good protection all round as well. The low profile keeps out wind but reduces the amount of space inside. Unlike other similar designs there is no ground protection. The Holden tarp tent is a simple but effective tarp shelter that’s easy and fast to make. Ideal for a square shaped tarp but you can use other sizes. ​Place the tarp on the ground and stake in the one of the long edges. Find the center of the opposite long side. Place a pole under this point and raise. The Partial pyramid design is not the easiest to make but offers good protection. The diamond tipped pyramid shape allows the rain to drain off the edges and stops any sagging. The shape also offers very good shelter from the winds on 2 sides. Little protection at the entrance. The sentry box tarp shelter is similar to the half box shape however it offers protection from 3 sides. You’ll need to find 4 trees close by or use 4 poles for the roof lines. The amount of room and height will depend on the size of tarp you have. The design can be used for as a shelter for a camp toilet. no protection on one side. The square arch is a fairly simple design that can be made quickly. Attach 2 guy ropes around 2 trees at about 3ft height depending on the size of the tarp. Throw the tarp over the guy ropes and put 3 stakes into the ground on each side. It’s a good idea to place one guy rope higher than the other to make an angled roof. This will allow water to run off. Otherwise the roof could start collecting rain and cause it to sag. The Toque tent tarp configuration is great for protection against rain wind and sun but lacks any ground cover. It is also one of the more complicated designs. ​You’ll need two find to trees to tie the guy rope around or use 2 poles. Make sure the tarps center ​tie out loop is attached to the roofline guy rope. From the same center tie out also attach 2 more guy ropes and thread them through the tie outs on the bottom corners as in the picture. Then stake these two ropes into the ground. Stake the remaining three corners into the ground. Good shelter from the rain, sun and wind. Good all around rain run off.